Sometimes the secrets to why a fault is moving is hidden within the tiny structures of the rocks that are in the fault. And the human eye is not always capable of seeing those secrets. This is where Susan comes in. 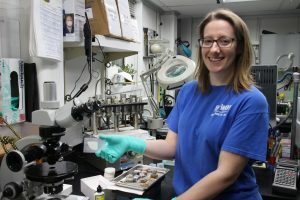 Susan Boehm is the JOIDES Resolution’s thin section technician for Expedition 375. It is her job to make very thin slides of the rocks and sediment for the sedimentologists to study under a microscope. “Thin, but not too thin” is her motto! It is a precise job, and often difficult on a moving ship. Susan first gets a sample of the core that is needed from the geologist who is requesting it. These are from cores brought up from different depths so they vary a lot in how soft or hard they are, and what their composition is. The process of making a thin sections is as follows. First, Susan glues them onto a regular microscope slide with epoxy glue. Then she uses a rock saw to finely slice off most of it until there is only a very thin layer of the rock left on it. She is aiming for a section of rock that is only 30 µm wide (µm is short for microns, or micrometers). A micron/micrometer is a millionth of a meter (1/1,000,000 meters). The average cross-section of a human hair is 50 microns. The human eye cannot see anything smaller than 40 microns in size. So, we’re talking thin! Once she has cut it she polishes it very finely and carefully with special clay. There is no going back if she polishes or cuts it too finely. 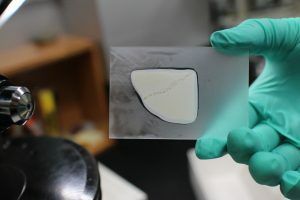 Apparently, it is very easy to over-polish and if you make a mistake you have to redo the whole slide again with another part of the sample. 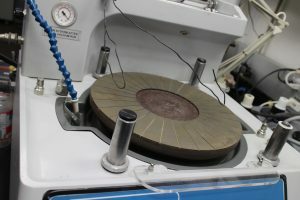 If she has a lot of hard rock to make thin sections out of she might do the polishing on this lapping wheel, which polishes them finely as it spins. Once the slide is made, Susan looks at it under the microscope to see if it is the correct width and there are grains and fossils visible. If not, she will polish it more. Here’s what we saw under the microscope of this thin section of mudstone. The circles in it are fossils called Foraminifera. 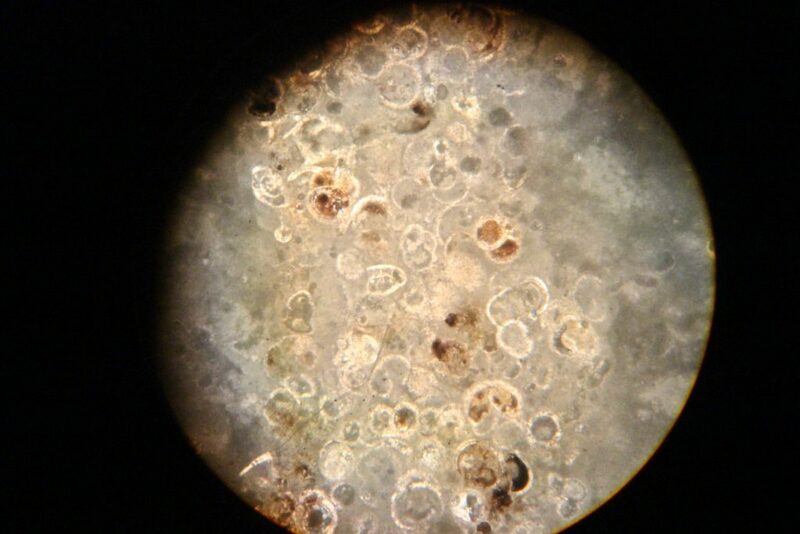 Foraminifera, or forams for short, are single-celled organisms (protists) with shells or tests (a technical term for internal shells). They are abundant as fossils for the last 540 million years. What do thin sections tell us? What fossils are in it and how many, which helps them date the age of the thin section, and therefore date the age of the core sample it came from. What crystals and minerals are present in it. 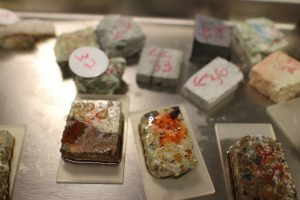 The minerals tell us where the rock has come from – e.g., it might contain volcanic minerals that show it has rolled down from the seamount nearby or come from an eruption. What the rock has gone through – has it been heated, or put under immense pressure? Or joined with another mineral in some way? Is there a boundary between layers? Sometimes the mineral content of a core sample changes but we can’t see that with the human eye. 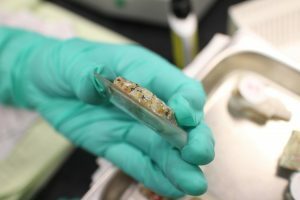 After the thin sections have been studied on the microscopes in the Core Lab here on the JR, they are sent carefully back to Texas to join the archived material from other expeditions in special storage facilities. 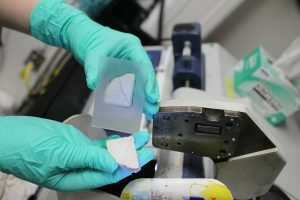 Scientists can request to be sent these thin sections in years to come if they have a research question that it can help them with.